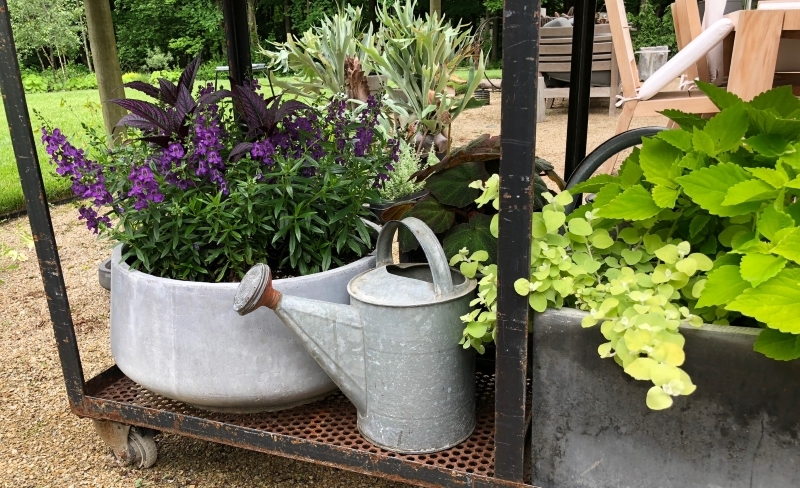 Besides being collectors and curators of very personal plant collections in our gardens, gardeners also collect an assortment of items related to enjoying their garden. I think if you look around your garden or tool shed you will find a few of your own collections. 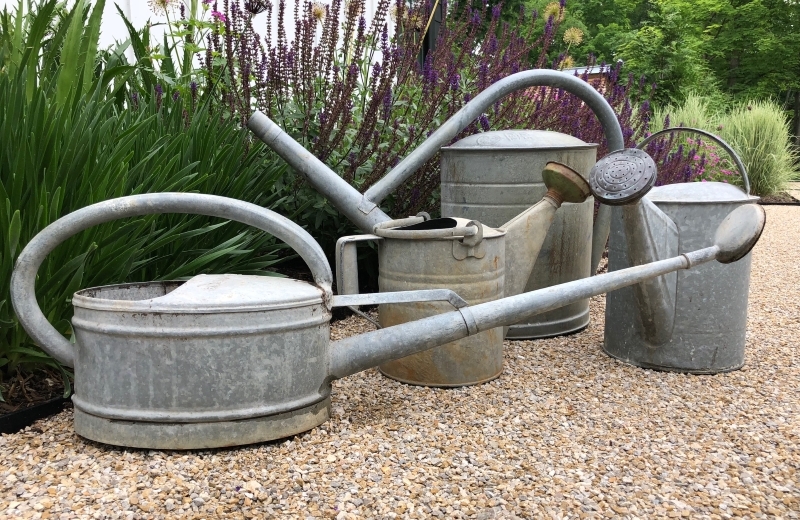 One of the collections I am guilty of having is vintage galvanized watering cans. 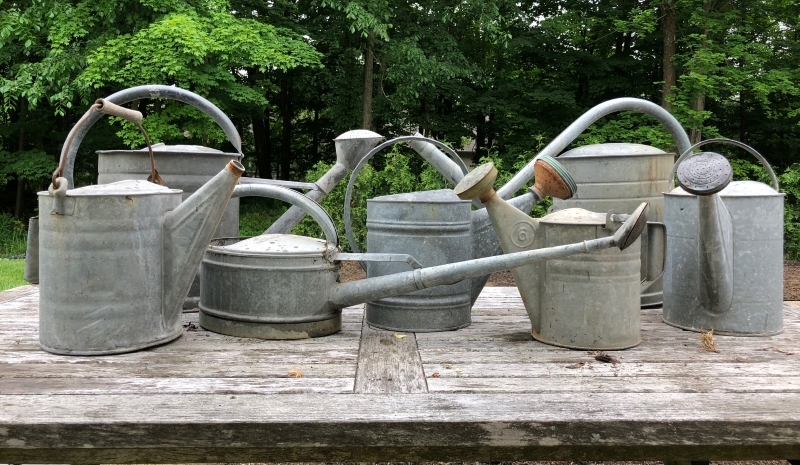 I don’t think you can have too many watering cans. They are always useful to have dispatched around the garden, full and ready to do any spot watering needed. Also, the galvanized versions look editorial when left in the garden compared to any plastic version. My collection is made of primarily finds from local flea markets or gifts from relatives, and many have quirks like random rust holes in spouts, repaired handles or missing the end sprinkler. However, they all still do a great job watering, even if each has their own strengths and weaknesses. 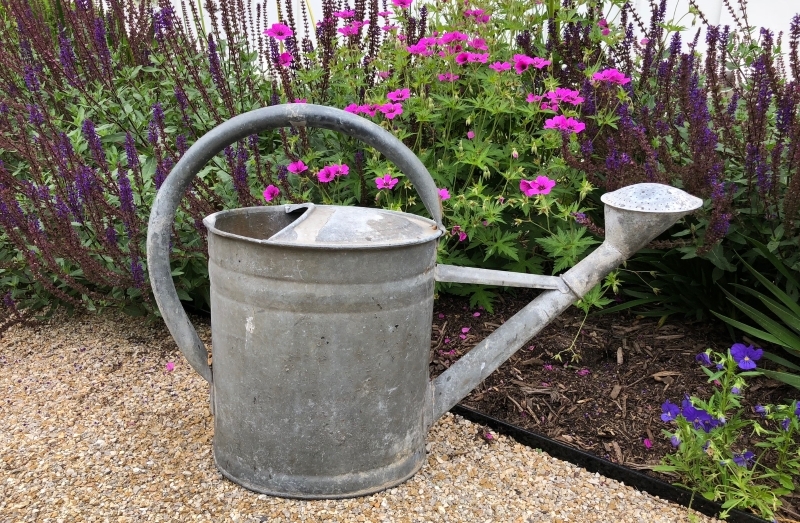 If you wish to expand or start a collection of galvanized watering cans, I would start by looking at local house sales, garage sales or flea markets. If you don’t have the patience for the hard search, you can try ebay, Etsy or local stores that carry vintage home and garden items. I generally don’t pay more than $40, however I enjoy the hunt. If you try Internet sources or retail stores, expect to pay at least double. This is one of my favorite cans. It is one of the largest, but is easy to carry around when full. Also it still has its original sprinkler nozzel which is the perfect sprinkling speed. On the bottom shelf of the plant stand we have tucked two watering cans. These collect any rain water or water dripping from the containers above. Plus the are the perfect size to fill the open spaces that are too small any other containers to fit. If you notice, the blog got a new look and logo this week. I will share more details about all that goes along with the redesign and branding in an following post. This entry was posted in Design 101, Gardeners Collect, Tools by Nick. Bookmark the permalink.